In this Photoshop text effects tutorial, we're going to learn how to use Photoshop's Layer Styles to easily make text look as if it's made out of plastic. To create the effect, we're going to be using some "contours" that we'll be loading in, since they're not readily available to us by default, but don't worry, loading them is easy, and so is everything else we'll be doing. Press "Alt+Backspace" (Win) / "Option+Delete" (Mac) to fill the new document with black. Select the Type tool from Photoshop's Tools palette. Choose your font in the Options Bar. Click inside your Photoshop document and add your text. Resize your text as needed using Photoshop's Free Transform command by pressing Ctrl+T (Win) / Comand+T (Mac), which brings up the Free Transform box and handles around your text. Hold down Shift to constrain your text's proportions and drag any of the corner handles to resize the text. Hold down Alt (Win) / Option (Mac) as well as you drag to force the text to resize from its center point. Press Enter (Win) / Return (Mac) when you're happy with the size of your text to accept the change. Choose the "Color Overlay" Layer Style. Click on the color swatch to choose a new color for the text. Choose a color for your text using Photoshop's Color Picker. The text now appears in the color you chose. I should note that we haven't really changed the color of the text here, even though it's now appearing in a different color. Technically, the text is still white. We've simply overlayed a new color onto it using the Color Overlay layer style. If we were to turn off the layer styles, which we won't but if we did, the text would appear white once again. Next, we're going to give our text more of a three-dimensional look by adding an inner shadow. Now, there is an actual "Inner Shadow" layer style, but we're not going to use it because it's limited to giving us a directional shadow. We want the text to appear to be surrounded by the shadow, so instead of using the ready-made inner shadow that Photoshop gives us, we're going to create our own Inner Shadow layer style by converting the Inner Glow style into a shadow. Click on the words "Inner Glow" on the left of the Layer Style dialog box. The "Inner Glow" options in the Layer Style dialog box. In order to change the "inner glow" to an "inner shadow", all we need to do is change the Blend Mode at the top. Click on the down-pointing arrow to the right of the word "Screen" and change the blend mode to Multiply. Our glow is now a shadow, or at least it will be a shadow once we select a darker color for it. The default yellow won't work very well as a shadow, so click on the color swatch directly below the word "Noise", which will bring Photoshop's Color Picker back up, and choose a much darker version of the color you chose for the text. I chose light blue for my text, so I'll choose a dark blue for the shadow. Lower the Opacity of the shadow to around 50% so it's not as intense. Make sure Edge is selected for the Source, and finally, increase the Size of the shadow to about 13 pixels. The text after applying the inner shadow. Click on the words "Bevel and Emboss" on the left of the Layer Style dialog box. Click on the down-pointing arrow to the right of the contour preview thumbnail. Click on the right-pointing arrow in the top right corner of the contour selection box. Select "Contours" to load a new set of contours. Click "Append" to add the new contours to the bottom of the original ones. Select "Large List" from the options to see both the contour preview thumbnails and the names of each contour. Double-click on the "Ring-Triple" contour to select it. Change the Bevel and Emboss options circled in red. These are the settings I used for my text. You may need to change them slightly depending on the font you're using and the size of your text. Starting from the top and working our way down, increase the Depth to around 131% and the Size to around 18 pixels. In the "Shading" options, set the Angle to 120° if it isn't already, and set the Altitude to 60°. Make sure Anti-aliased is checked beside the contour preview thumbnail. Increase the Highlight Mode Opacity all the way to 100%, and finally, lower the Shadow Mode Opacity down to 0%. Click on the word "Contour" on the left of the Layer Style dialog box. Scroll down the list to the "Shallow Slope-Valley" contour and double-click to select it. Fine-tune the effect by adjusting the "Range" value. The text after applying the Contour layer style. Click OK to exit out of the Layer Style dialog box for now. Click on the original text layer to select it once again. Drag the slider bar to increase the stroke size. 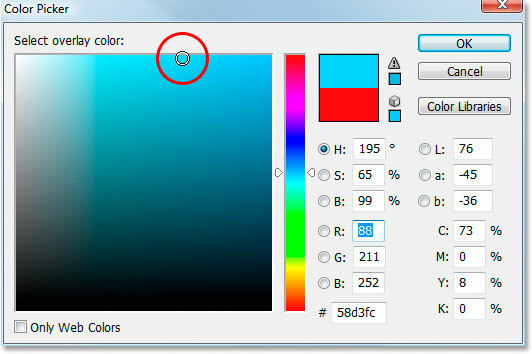 Click on the color swatch in the Stroke options. Sample a color from the text that's about midway between the lightest and darkest text colors. Click OK to exit out of the Color Picker when you're done. Click on the words "Bevel and Emboss" to access the Bevel and Emboss options once again. Change the Bevel and Emboss "Style" to "Stroke Emboss". Increase the Shadow Mode Opacity to 40%.